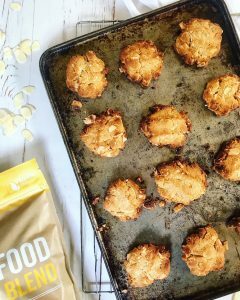 This year I’ve teamed up with 180 Nutrition to bring you these Superfood ANZAC Biscuits, packed with nutrients. Have you tried 180 Nutrition Protein Superfood before? I mostly use it in smoothies but I also love to use it in baking, pancakes, waffles, muffins, soups and more. The reason I love it is because it’s a 100% natural product – no chemicals, fillers, stabilisers, artificial sweeteners. The business is also a local Aussie business, and I always like to support local. I don’t know about you, but when I make a smoothie, I’m wanting to put all of those things in there anyway, so 180 Vegan Superfood just saves me the time haha! Head over to 180 Nutrition to check it out! 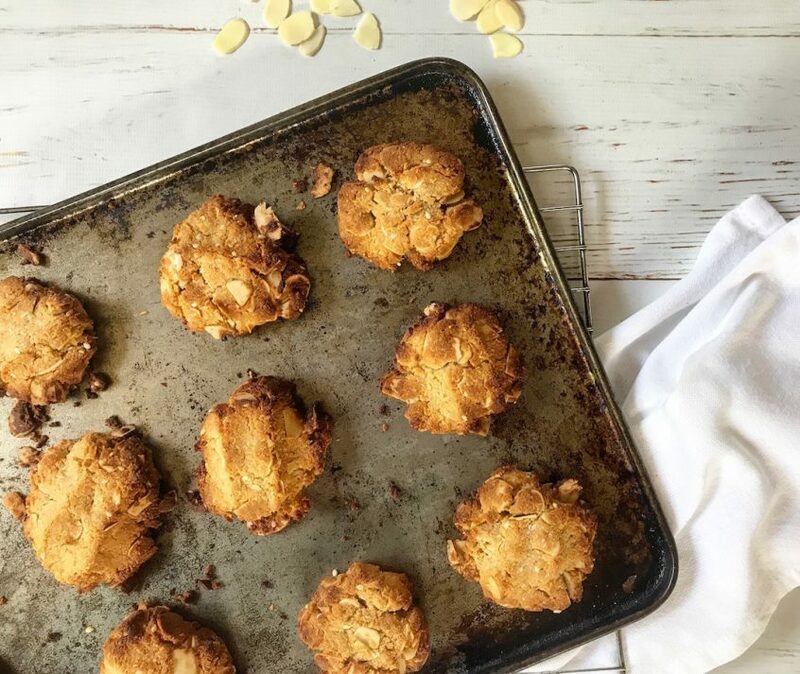 Swap rolled oats out for flaked almonds to make the biccies Gluten-free. HOWEVER I went back to using butter and golden syrup for a more traditional flavour. You can of course use coconut oil instead of butter for vegan/dairy-free. And swap golden syrup for Maple or Honey if you prefer. I also added a little Maca which only adds to the delish caramel flavour. Preheat a fan-forced oven to 180deg C and line a baking tray with baking paper. Mix dry ingredients (except baking powder) together in a bowl until well combined. Mix melted butter and syrup together in a separate smaller bowl. In another small bowl or glass, mix 1.5 T boiling water with the baking powder to combine. Add all wet ingredients (butter/syrup and baking powder/water) to dry and bring together with a spoon, and ultimately your hands! Add a little water to the mixture if it seems like it’s too crumbly (won’t form into balls/biscuits). This happens sometimes depending on the different seasons/batches of the natural real food ingredients we’re using here. Form the mixture into balls then flatten out on a lined baking tray, imprinting the top of each with a fork. 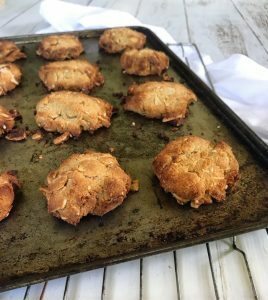 Bake for 10 mins for softer biscuits, or 15 mins for crispy biscuits. Removing and allow to cool. Store in an air-tight container in the pantry for a few days before moving to the fridge if not finished! This happens sometimes because all natural products are not all the same each season (some seasons the coconut is oilier and almonds drier etc.). If you used coconut oil instead of butter the consistency may also be slightly different. So that’s why I added step 6 to add a little water if you feel the mixture is too dry/crumbly. I hope they turn out ok for you!